Being completely new to the research area of newborn babies I was initially struck by the contrast in advice surrounding the swaddle, initial research shows swaddling your baby and keeping them close to be the most traditional and natural approach to motherhood, as you can see from images below, I found extensive evidence of native, non-western, women swaddling their children. Also drawing on a personal experience I recall visiting a community in northern Vietnam and observing a swaddled baby on mother's back while she worked, stopping only to loosen the Swallow and let the child’s waste flow away then the child quickly became swaddled back again. Could this really be 'unhealthy'? It has been noted in some of my further research that the different types of swaddling across the world highlight the dangers of swaddling to babies health "Cultures that keep infants’ hips extended on a cradleboard or papoose board have high rates of hip dysplasia in their children. Cultures that hold infants with the hips apart have very low rates of hip dysplasia." (Dysplasia Institute., 2012) This research would indicate that the way children are swaddled and the resulting hip dysplasia is the root of main concern to the medical profession. However, in 2011 a study by the National Resource Center for Child and Health Safety (NRC) and the American Academy of Pediatrics (AAP) concluded that swaddling “swaddling is not necessary or recommended in any childcare setting.” (DeJeu et al., 2016) The AAP named several specific swaddling-related concerns, beyond Hip dysplasia, adding, “Loose blankets in the crib (if a baby breaks free of the swaddle, the blanket can cover his face, increasing the risk of SIDS.) Stomach sleeping (if a swaddled baby is placed on her stomach to sleep, or if she rolls from her back to her stomach while swaddled, it increases the risk of SIDS.) Improper swaddling technique in general (the AAP has concerns that not all childcare workers know how to safely swaddle babies.)" (DeJeu et al., 2016) it is off the back of such stark advice that some American mothers now believe swaddling your child to be ‘illegal’. With all this in mind, I had a meeting with two new mum’s Kate and Jackie. 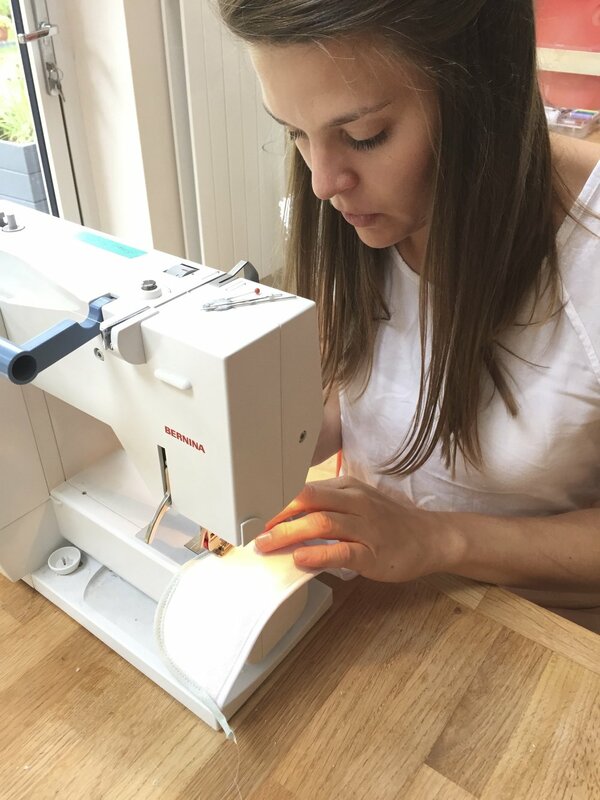 Kate and Jackie openly refer to themselves as attachments parents, they are both well educated and highly informs mothers and were able to share some of the research and findings of the benefits of swaddling or baby wearing. 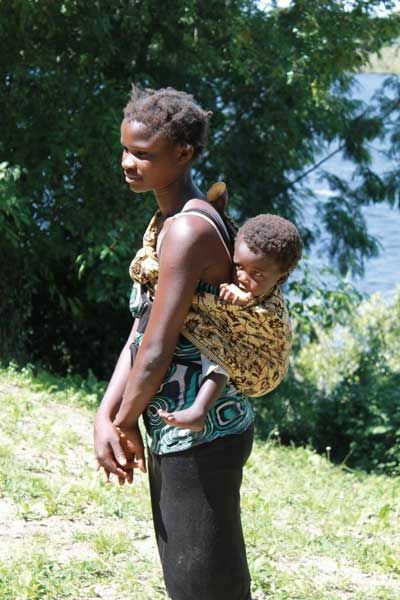 “When a proper hip position is maintained while baby wearing, there may be a substantial benefit for natural hip development. The Spread Squat position…with the thighs spread around the mother’s torso and the hips bent so the knees are slightly higher than the buttocks may decrease the risk of hip dysplasia” (Dysplasia Institute., 2012) To hear more about the advice they gave me go to blog post ‘meeting two new mums - Kate and Jackie’. During our meeting discussion turned to the benefits of having a swaddle that could be used to put your baby down at night. One of our main problems is the baby falls asleep on us and then putting them down is a real problem as they are swaddled to your body. I had a lot of ideas and suggestions around a double swaddle idea with clips, however, as the discussion continued I soon realised this could be a whole project in itself and that my attention needed to be spread across other areas. Now approaching my design specifications, the swaddle cloth must still consider the concerns raised by the AAP; there must be no loose blankets, promotion of baby being on their back, sufficient instruction ensuring parents know how to correctly position their child, alongside ensuring the design avoids any leg entrapment and subsequent Hip Dysplasia. "When in the womb the baby’s legs are in a fetal position with the legs bent up and across each other. Sudden straightening of the legs to a standing position can loosen the joints and damage the soft cartilage of the socket." (Dysplasia Institute., 2012) keeping your legs slightly bent with the freedom to move around seems to be another major consideration and raising the newborn’s legs is worth considering. 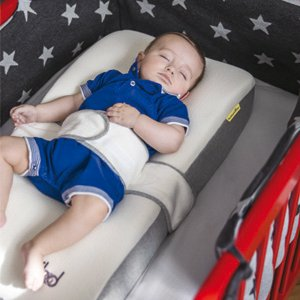 I then moved my research onto currently available models on the market, I found a company called Cosycover who have a range of swaddle like tummy bands, "Baby needs to feel as reassured and safe as he was in his mum's womb.”" (Cosybag, 2014) Cosycover's product range addresses the newborn at different stages of their growth and development with key features appropriate to development times. This research has informed my design consideration for having multiple swaddles. My design will change as the baby grows, there will be 3 different sizes of cover/swaddle alongside a new leg raise size at each stage, 0-2 months, 3 -5 months and 6-8 months, I have used these markers as these are the dimensional differences I have referenced throughout the design process. It is worth further research to determine whether; should a mother continue to use the 0-2 month swaddle and leg raise would there be any detrimental effect on the child’s growth or development? 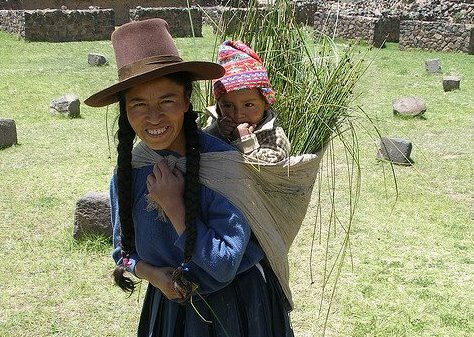 - Have no loose or excess fabric surrounding the baby’s face. 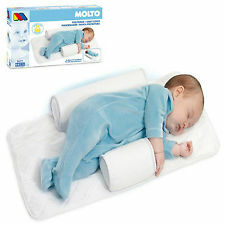 - Designed to actively encourage the baby to be laid on their backs. - Be clear and obvious in the direction of use. - Avoid any sorts of leg entrapments or constraint to the hip joint. - Aid in a slight raise of the knees and legs. 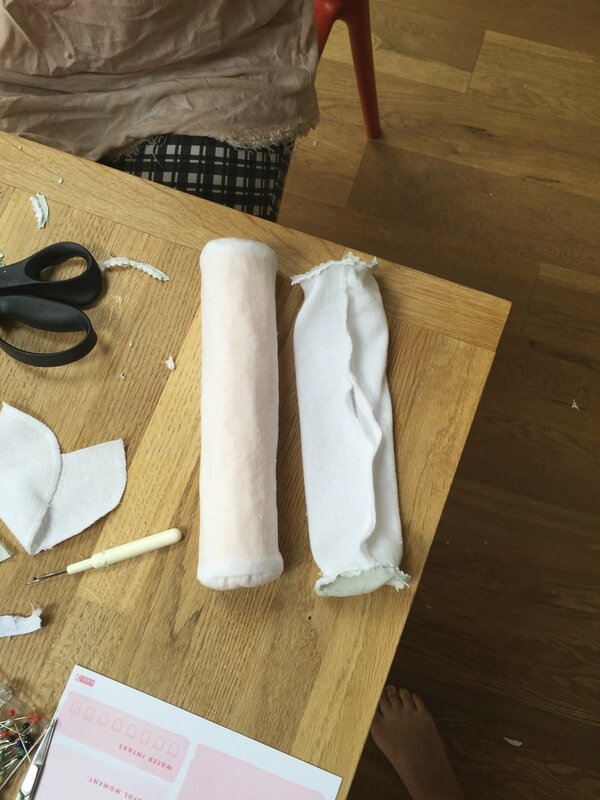 With all this in mind I began by creating an initial prototype pattern piece, referencing both the midwifery baby doll and the ergonomic dimension’s (Tilley, Associates, and Wilcox, 2001) I was able to create the first fabric prototype. As you can see from the images below, once I had the initial fabric prototype I was able to make further allowances for the arms and legs, ensuring sufficient space for hip rotation, from here the design went through various changes and alterations. A major consideration and alteration was how to attach the leg raise. 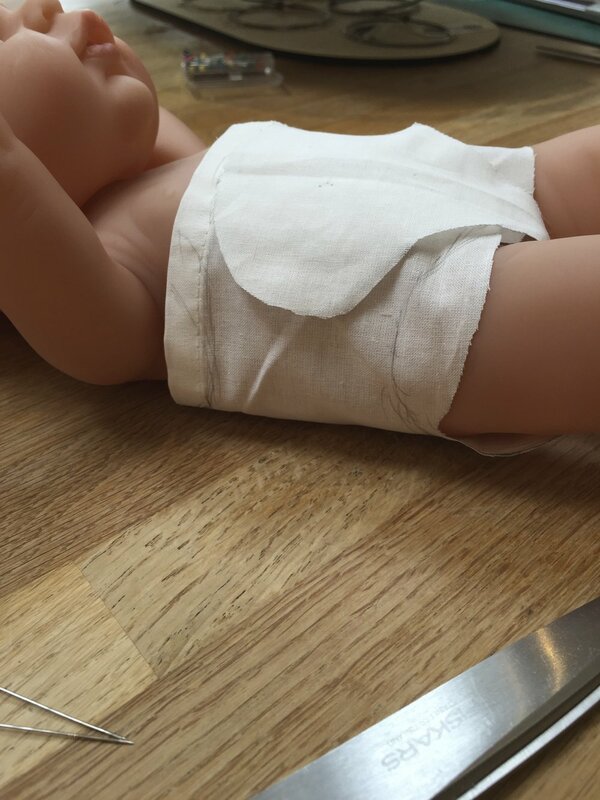 After movement and attachment trials I concluded that the ‘though leg piece’ was superficial and could therefore be used to attach the leg raise to the swaddle. 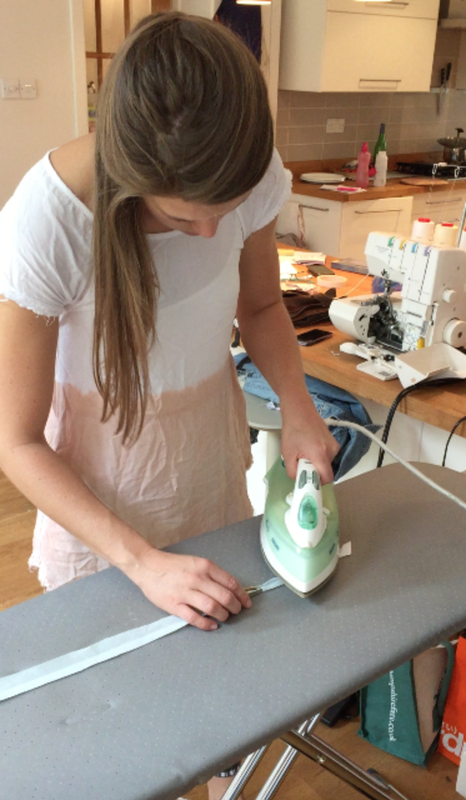 Along side this, using Katie’s curvature tool I was able to alter the pattern piece, ensuring the swaddle piece is both manufacturer-able and had curves that could take a channel edge. 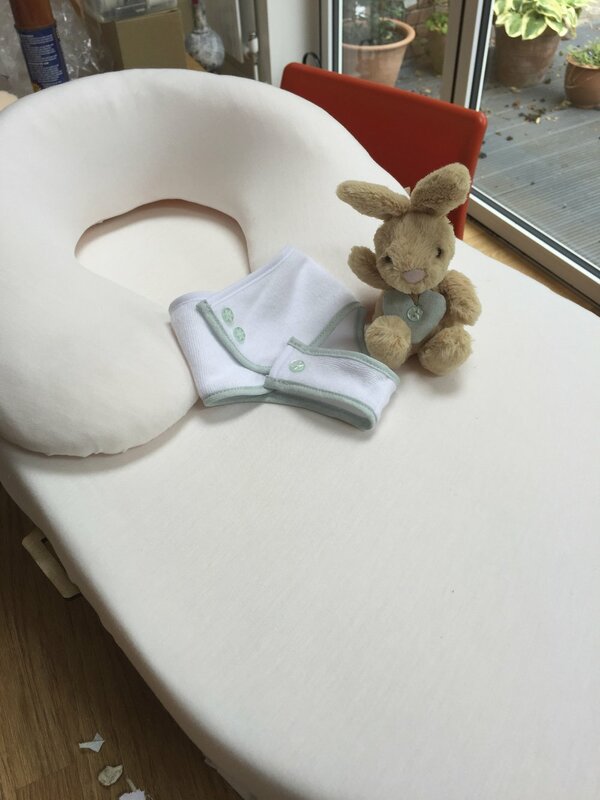 The fabric chosen for the swaddle is a terry towelling, white, 100% cotton material, this fabric has been chosen for its natural fibre content, it’s soft and tactile texture and for the rigidity Katie has mentioned. Should this product going to manufacture trialling surrounding the blue edge’s potential to bleed onto the white cotton should be explored. Getting the blue fabric on the bias allowed for a flexible piping edge piece, from here I used the piping toolironing flat as you go I was unable to heam the edge of the swaddle using the blue fabric, this gave the swaddle a professional finished look and feel. Having finished the swaddle cover I gave the ends the same blue fabric colour in keeping with the colour scheme is also had a professional finish. From here I explore the use of buttons have a decorative to finish, in manufacture and final production these buttons would be appliquéd to the surface insuring no risk of choking hazards to the infant. This will ensure the project keeps within the EN-71 small parts European laws. Another consideration taken into the final design what the attachment method, used to hold the baby in place, consideration was taken into the abrasive nature, the noise created and the fiddlyness mums would be able to tolerate on a daily basis. Despite Velcro being a noisy option, overall this was my attachment method of choice, chosen for its versatility as the babies torso grows, and for its simple and easy attachments and removal. Also having considered the available sample options Josh was able to provide me (a member of the design team for the paramedic response luggage Company) there are my anti microbial nonabrasive Velcro is available, this Velcro don’t have a shorter attachment lifestyle than conventional Velcro however considering the lifespan of this product 90,000 attachments should be sufficient! The final stage of the swaddled prototyping what tounderstand the position at which the swaddle should be attached to the under sheet, the attachment must be sufficient to keep the baby in-place while not hindering the leg or hip movement. Equally ship this will be placed to high there would be irritation under the baby’s arms. By consulting the ergonomic dimension book I have stitched this model in an appropriate place, this however is a feature I feel would need further user trials. In summary of the prototyping section of the swaddle, I feel this elements of design has A lot more legs as previously discussed with Kate and Jackie allowing for mothers to swallow their babies and then place them into the snuggle is a whole project in itself for now this was addresses the main safety issues raised by the AAPwhile also giving parents peace of mind that the child cannot roll out. In the time I have had and the scale of this design project I’m happy with this final outcome. BabyCentre, the (2016) Milestone chart: One to six months. Available at: http://www.babycentre.co.uk/a6476/milestone-chart-one-to-six-months (Accessed: 25 August 2016). Cosybag (2014) Available at: http://www.babymoov.co.uk/keyfeatures/43-cosycover-3661276009943.html (Accessed: 3 July 2016). DeJeu, E., K, A., Jules, M, J., Slade, E., Kempnich, M., M, F., Watson, H., Pfeifle, H., Everhart, J. and Obilo, M. (2016) Is Swaddling Your Baby Now Dangerous (and Illegal)? Available at: http://www.babysleepsite.com/newborns/is-swaddling-baby-dangerous/ (Accessed: 6 August 2016). Dysplasia Institute., I.H. (2012) Hip-healthy Swaddling. 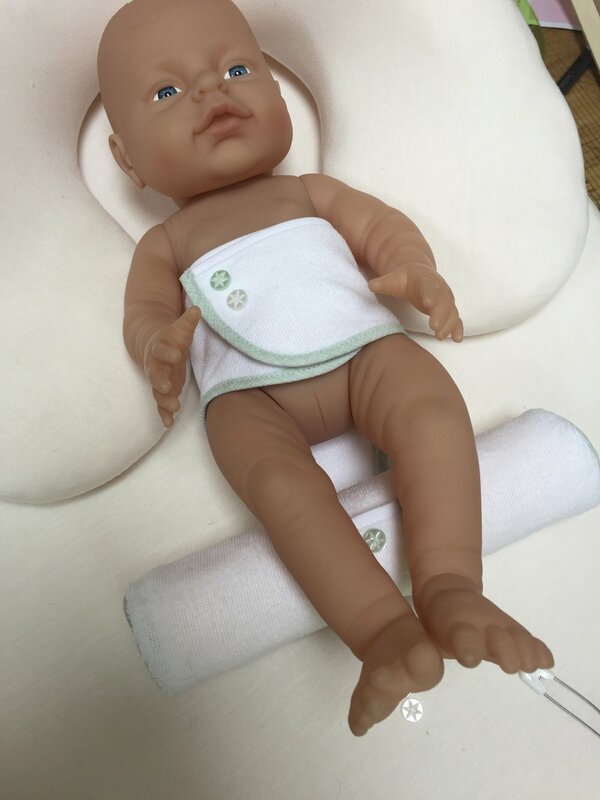 Available at: http://hipdysplasia.org/developmental-dysplasia-of-the-hip/hip-healthy-swaddling/ (Accessed: 6 August 2016). Pediatrics, A.A. of (2015) Swaddling: Is it safe? 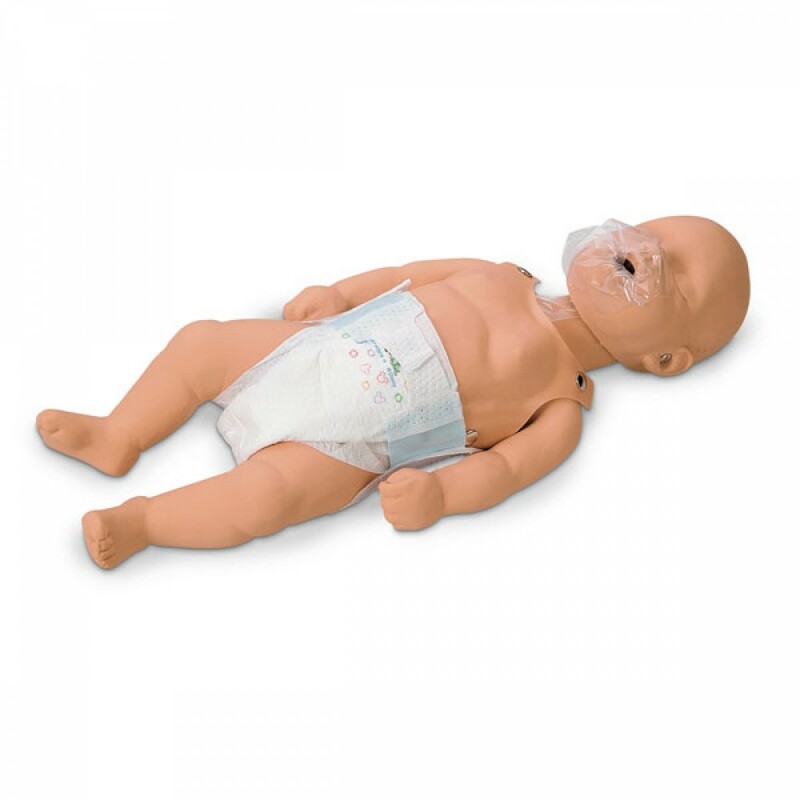 Available at: https://www.healthychildren.org/English/ages-stages/baby/diapers-clothing/Pages/Swaddling-Is-it-Safe.aspx (Accessed: 5 September 2016). Tilley, A.R., Associates, H.D. and Wilcox, S.B. (2001) The measure of man and woman: Human factors in design, revised edition. New York: Wiley, John & Sons.